Photo: Lobo Point in the early morning. Eastern Mojave Vegetation Lobo Point in the early morning. The dark layer is welded tuff of the Hole in the Wall Formation (McCurry,1985) which is faulted underneath the landslide seen in left center. 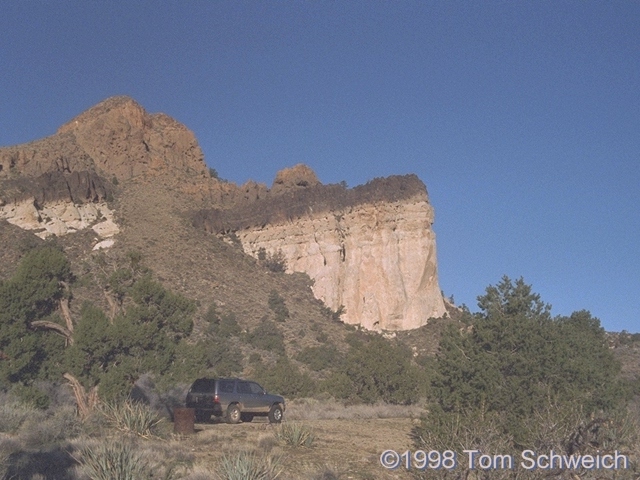 The light colored rock below is an air fall tuff, also a unit of the Hole in the Wall Formation. Many species of birds nest in the cliffs of Lobo Point. Wild Horse Canyon Road - Mojave National Preserve: at Lobo Point. The Vegetation of Lobo Point and North Wild Horse Mesa, Mojave National Preserve, San Bernardino County, California. : Introduction.